CUT YOUR RECOVERY TIME BY HALF: MAKE IT YOURSELF TO LAST: CUSTOMIZE IT: SAVE TIME AND MONEY. Apart from a pair of headphones and something decent to dig with, the most useful aid to metal detecting is an electronic pinpointing probe as described here. The time spent locating tiny objects that have been detected, especially in muddy and sometimes bad light conditions can be considerable, and is time that is better spent looking for the next target. When searching on farmland or beaches in poor light conditions this probe will at the very least double your detecting efficiency. 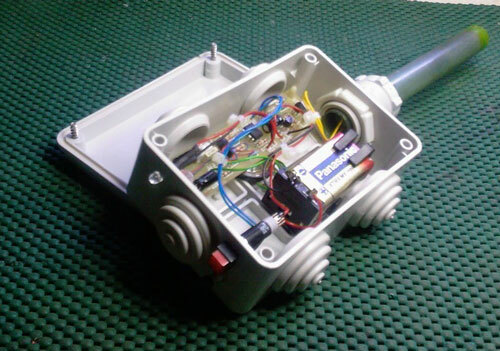 The good thing about making your own probe is that you can make it to suit your own needs ( Customize it ). 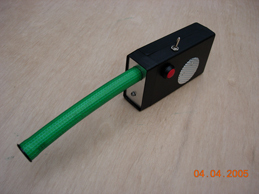 The one above uses a ready made plastic box with built in battery compartment, the probe it self is flexible being made from a piece of garden hose. A mercury tilt switch is wired in series with the power switch so that the probe comes on automatically when it is pointed towards the soil. Pinpointing probes are not a new idea. They have been on sale for at least twenty years, although very little development or improvement have been made to the original idea. The 1st probes were home made devices, cobbled together by enthusiasts, usually made from parts taken from hand held metal detectors of the type that are sold in DIY stores. 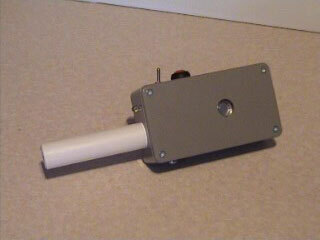 The type of device that is used for detecting nails, pipes, or wires in floorboards. Such devices always have some sort of rotary tuning wheel or knob that will soon break or get clogged with mud. With the probe described here the tuning is automatic you just need a sealed pushbutton to change modes and some way to switch it on and off. By a sealed switch or internal tilt/Mercury switch for example. One thing that is certain though, once you go detecting with a pinpointing probe you will soon find it an essential tool that is a must have aid for your detecting adventures. Made by William De Beer from New Zealand. 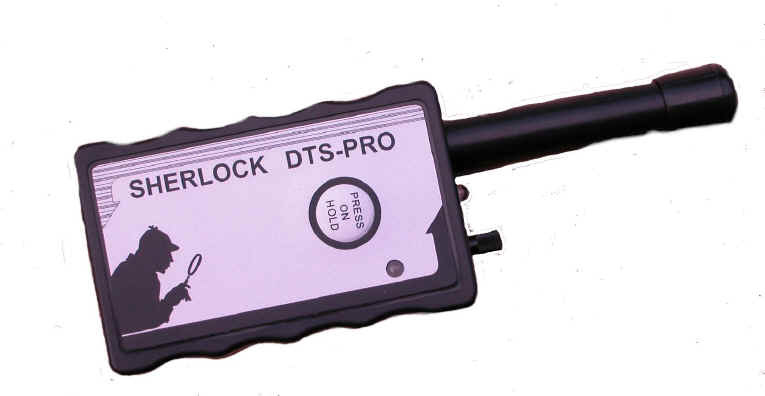 This probe is a DIY project, we do not sell ready made probes. 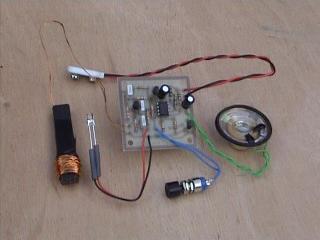 You do not need any electronics knowledge to build this probe although if you do have some it may help. To build this probe you will need the following. 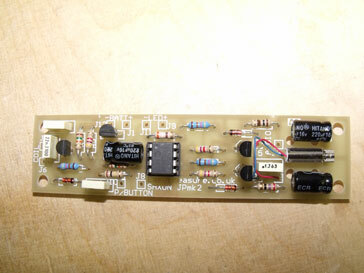 Ready assembled and tested circuit board ( only available from us ). all parts are soldered to the board, including ready programmed pic 12F675 microcomputer. some enameled copper wire .25 or .31 or .4 Enough to wind about 100 turns on ferrite above ** see note 2. 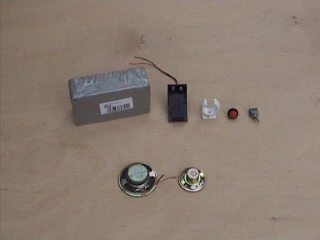 From left to right: Small plastic box, battery holder with leads, pipe clip, pushbutton, on/off switch, and two small 8 ohm speakers at the front. Note 1: Ferrite rod is a black material that can usually be purchased from electronic component/amateur radio type shops. It usually comes in lengths about 100 to 150mm long. You only need 50mm so you will have to cut it and it is about as hard as glass. To cut ferrite rod you will have to score it in some way with the edge of a file or a hacksaw blade. Then press it over a matchstick or similar until it snaps. It is a bit like cutting a tile. 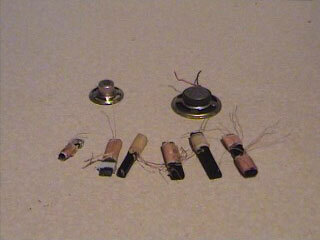 If you have an old broken radio with an AM band then there will be a piece or ferrite rod inside that can be salvaged. Sometimes ferrite rod is square section say 6 x 12 mm, this will be OK. 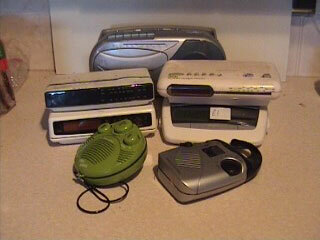 Above is a selection of old radios purchased from a car boot sale one Sunday morning for less than a pound each. 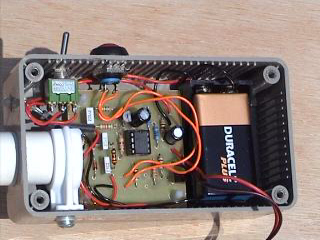 The two small radios at the front also contained very useful tiny speakers. Note 2: Enameled copper wire can also be purchased from electronic component suppliers, but you could make a thousand probes with the wire from a small reel. So again look in old broken radios etc. You need about 2-3 metres of wire. Plastic covered wire will do but it has to be very thin. The type of wire that is wound on ferrite rod aerials is too thin for this project. If you don’t mind buying a small reel of wire then .25 copper-enameled wire will be perfect. Enameled copper wire is now included with the board. For the cost of the above items you could probably buy a ready made probe, but it won’t be as good as this one. The commercially made probes I have seen do not work as good as this one. They are usually made in China, badged in America, and use really crap components that soon break. And they always have some sort of rotary tuner that gets jammed with mud. 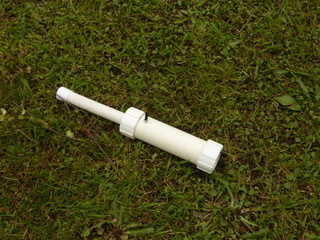 You can fashion this probe to suit your own particular needs, and make a far better probe that will last. As with everything to do with metal detecting the performance of commercially made probes has been greatly exaggerated. The probe described here will react to a small coin from about 25mm ( 1 inch ) from the tip of the probe or to the side. I have not seen a commercially probe that betters this. Four modes of operation . The probe gives an audible bleep when the tip comes close to metal. It also gives a visual indication with a bright LED that can be situated to shine on the target area. Modes are selected by pressing the pushbutton in a cyclic manner. E.G.. Normal audio: Normal audio plus LED: Normal LED only ( for silent searching ): Geiger ( ticks like a Geiger counter and speeds up when near metal. Then back to normal audio again. Each time the probe is switched on it starts in the same mode as when it was last used. Tuning is automatic. Pressing and holding the pushbutton for about 3 seconds will turn on the bright light to be used as a small torch. Uses Pic 12F675 microcomputer.Battery low indicator. Each time the probe is switched on it does a battery self test. If the battery is OK the probe bleeps once. If the battery is getting a bit low the probe bleeps twice. 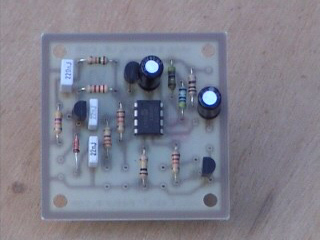 Board measures 2 * 2 inches 50mm * 50mm. .
Five modes of operation . Two tone bleep at switch on. High/low = battery OK. Low/high = battery getting low. Gives this chirp about once a minute in silent modes to prevent being left switched on and aid in location if dropped or lost. Mode 1 = similar sound and performace to Garret and Minelab probes. Broken bleep with flashin LED. Mode 2 silent with flashing LED. Mode 3 = Geiger counter type blip and flashing LED speeds up near metal. Mode 4 = vibrate and flashing LED. Mode 5 makes a sharp tone that changes near metal. When switched on the probe starts in the same mode as when it was last used. Tuning is automatic. 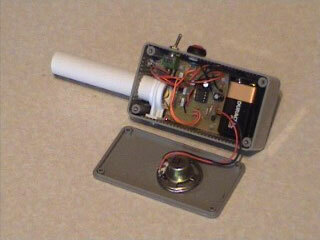 Pressing and holding the pushbutton for about 3 seconds will turn on the bright light to be used as a small torch. Uses Pic 12F675 microcomputer. Board measures 4 * 1 inches 25mm * 100 mm. To begin with you must construct the coil. You need a piece of ferrite about 50mm long 10mm diameter or square section about 6 x 12mm. On the end of this rod that has not been cut ( the smooth square end ) you must glue a plastic or cardboard disc. This disc needs to be a nice fit into the plastic overflow pipe above ( about 19mm diameter ). Then wind the copper wire ( 100 turns . 4mm ) starting close to the disc at one end slowly moving along the rod to about 10mm and then back again until you have wound on 100 turns ( any direction ). You need two flying ends coming from this coil that will later be connected to the circuit board. 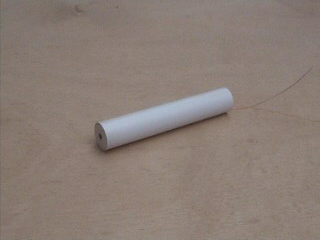 Secure these ends to the ferrite rod with tape but do not cover the wound part. 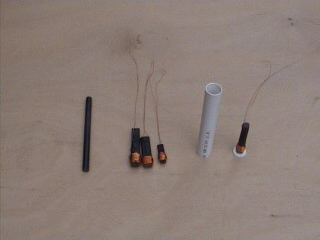 From left to right: Ferrite rod, 3 pieces of ferrite taken from radios and wound with 100 turns of wire, 125mm long x 22mm dia plastic overflow tube, wound ferrite rod glued to plastic disk. This tiny coil needs to be fixed inside the plastic overflow tube. How long you cut this tube is up to you. On most probes the probe tube is about 100mm long with about another 25mm going into the box. So you cut the tube 125mm long, or it can be longer its your choice. 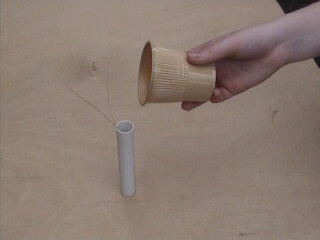 The coil is fixed as close as possible to one end of the tube with the flying leads coming out of the other. 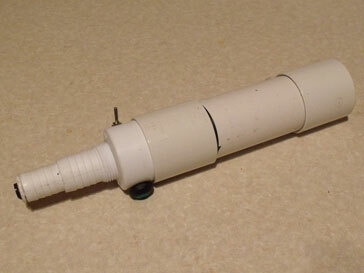 You need to block the coil end of the tube some way with a rubber/plastic cap or tape. You need to pour something down the tube to secure the coil in place. Make sure the far end of the tube is well sealed with masking tape or a glued in plastic disc or cap, then pour in for example. Two part Epoxy glue, Epoxy Resin, or silicon sealant. Paint or varnish may take a long time to harden so avoid this. Two part car body filler may do if you can get it down the tube. 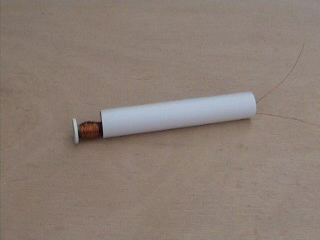 Placing wound coil into plastic tube. Pour in a small amount of wax, epoxy resin, or two part glue. 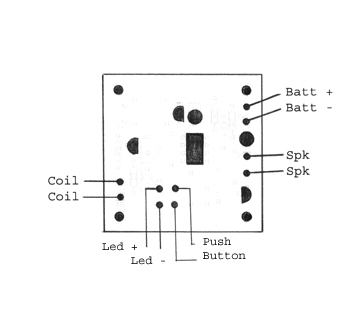 Examine the LED ( Light emitting diode ) supplied with the board. You will notice that on the LED one lead is a bit longer than the other. Carefully solder a piece of Red wire to the longer lead and a piece of black wire to the other lead. Try not to get the LED to hot. If you do not have red or black wire use other colors as long as you remember what color is connected to the positive ( longer ) lead. LED’s will not work if connected the wrong way round. Slide a piece of rubber sleeve down one of the wires to stop shorting. You have to buy the circuit board from us. We do not sell to dealers agents or middlemen. The price for the board ( assembled and tested ), LED, and copper wire is ( £25.00 for Jonnie Probe Mk 1) and ( £30.00 for Jonnie Probe Mk2) inc Air Mail postage to anywhere in the world. We accept payment by Cheque, Money Order, Paypal or Cash. Make payment to: DAVID SMITH. ( must be in Pounds Sterling ). As long as we get the money some way you will get the board. If sending cash don’t send coins. 1 £20 and 1 £5/£10 note will do nicely. Paypal is rapidly becoming the easiest and safest way to pay for items like this on the internet. You can pay using your credit card via Paypal even if you don't have a Paypal account. So many people have had trouble getting the enameled copper wire so now it is included with the boards.